Cooked onions provide strong flavor to many foods, and make up the base seasoning in many staples of the average American diet. Although onions are typically sautéed in oil, you can reduce the fat content by boiling or steaming them instead. Cooked onions can also be added to soups or used as a topping for pizza or steak. One cup of sautéed yellow onions contains 115 calories. Because onions absorb oil as they cook, the majority of these calories come from fat. One cup contains 9.4 grams of fat, which provides more than 80 calories to the meal. Most of these fat grams come from polyunsaturated and monounsaturated fats. Only 1.3 grams comes from unhealthy saturated fat. 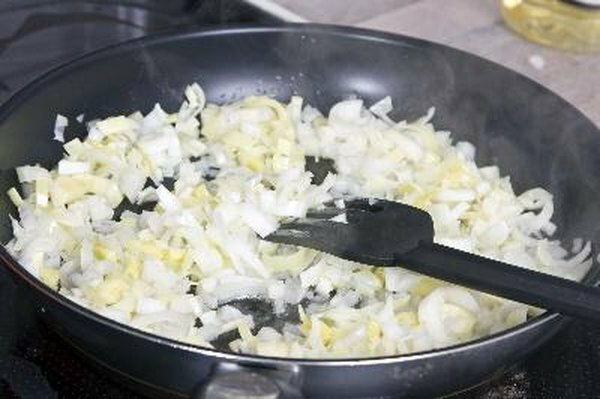 Although onions cooked in oil contain no cholesterol, sautéed onions will contain a small amount of cholesterol if you cook them in butter. The remainder of the calories in each serving of cooked onions come from carbohydrates and a small amount of protein. Each cup contains 0.8 grams of protein and 7 grams of carbohydrates. These carbohydrates are made up of sugar, which is a simple carbohydrate, and fiber, which is a complex carbohydrate. One cup contains 1.5 grams of fiber, which provides approximately 6 percent of the recommended daily intake for women. Although cooked onions do not contain a large amount of any one mineral, they do contain small amounts of numerous minerals. One cup supplies 2 percent of calcium, zinc, copper, potassium and magnesium. One cup also provides 4 percent of manganese and phosphorus. Consuming these minerals supports the health of your bones, aids in enzyme activation and also benefits your nervous system. Cooked onions also contain only small amounts of most water-soluble vitamins. However, one cup does contain a larger amount of vitamin B-6, with 14 percent of the daily value. Vitamin B-6 supports the nervous system, helps you form red blood cells and aids in the function of your hormones. Add onions to your diet as a source of vitamin K, a fat-soluble vitamin. One cup provide 21 percent of the daily value of vitamin K for women and 16 percent for men. Vitamin K helps your blood clot properly. It also promotes skeletal health, and a diet rich in vitamin K might help keep your bones strong as you age. A lower fat option for cooking onions is to boil them. One cup of boiled onions contains 92 calories and only 0.4 g of fat. Boiled onions are also higher in some vitamins and minerals. One cup provides 14 percent of the daily value of manganese, 16 percent of copper and 7 percent of potassium. One cup also supplies more than 10 percent of vitamin C and 21 percent of B6. However, boiled onions contain less vitamin K per cup. One cup supplies less than 2 percent of the daily value for both men and women.